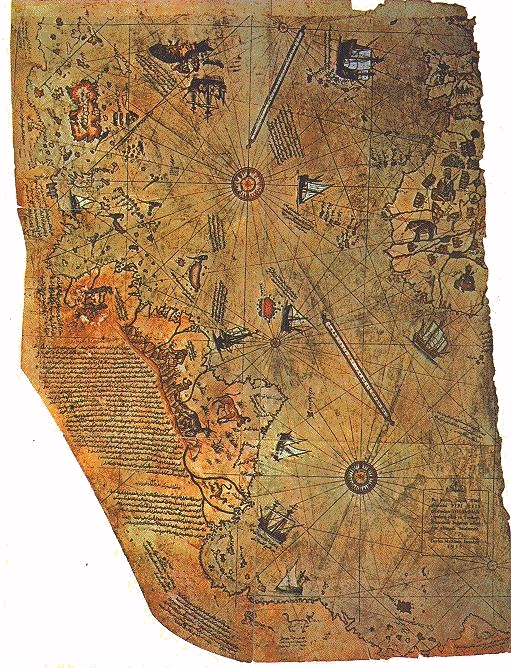 This site attempts to mystify the 1513 Piri Reis map of the world, including the New World, produced in Istanbul. It is alleged that it shows the coast of Antarctica as well as more South American detail than is reasonable for that date. It was based on Ptolemaic, Arab and recent Portuguese maps. Professor Steve Dutch of the University of Wisconsin – Green Bay, has relentlessly debunked spurious claims about the map, showing that it is based on perfectly ordinary Portuguese maps of Piri Reis’s own day, and contains nothing that they would not have known. He maintains that the bottom line sometimes thought to be the Antarctica coast is just a mistakenly rendered Tierra del Fuego. It took Dutch a lot of time to painstakingly debunk the pseudoscience here, and we should all be grateful to him. By the way, the Ottomans were locked in a kind of world war with the Portuguese (or Spanish/Portuguese) in that period, in the Mediterranean, in the Persian Gulf and in the Red Sea. Some historians have speculated that Ottoman military movements into North Africa may have been intended to get them to the Atlantic such that they could make a bid for colonies in the New World itself. Was Piri Reis’s map a war plan for an Ottoman colony in Brazil? As it happened, although Salih Reis did briefly take Morocco and get to the Atlantic in the 1530s, the Ottomans soon lost the toehold. They were defeated in the Persian Gulf and Arabian Sea by the Portuguese. ‘ The conquest of northern Morocco by Ottoman admiral Salih Reis (1553) proved to be short-lived. But even without a Moroccan port, the Ottoman fleet managed to make its presence felt far beyond the Straits of Gibraltar. Throughout the 16th and 17th centuries, Ottoman corsairs based in Algiers ventured out into the Atlantic as far as the Canary Islands to raid Spanish and Portuguese treasure ships returning from the New World. And in 1627, an Ottoman fleet of 15 ships (12 galleys and 3 other types of vessels), led by Murad Reis, sailed 2000 miles beyond the Straits of Gibraltar into the North Atlantic, raided an island off Iceland and took 400 captives back to Algiers. Ottoman strategic and scientific interest in the New World also did not end with Piri Reis.